“He went as long as he could,” said Hue Jackson, in a somber tone. 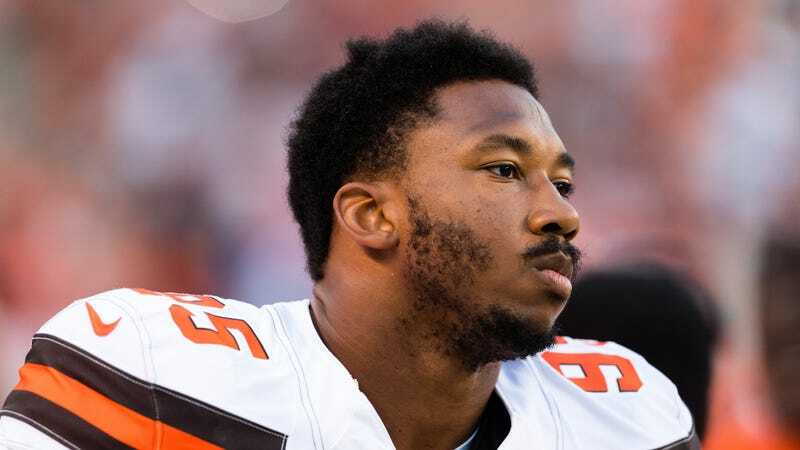 The Browns confirmed today that rookie DE Myles Garrett has been diagnosed with a high ankle sprain—in plain terms, some tearing of the ligaments connecting the tibia and fibula—suffered in a practice accident on Wednesday, when a teammate stepped on his right foot. Garrett wasn’t able to finish practice, and went for an MRI exam. How long will Garrett be out? Good question. One Browns source told Cleveland.com yesterday that they fear it could be weeks, “possibly four or more.” In the team’s announcement this morning, they only said that Garrett will be reevaluated in “a couple weeks,” which would entail at the very least missing divisional games against the Steelers and Ravens. So it could be a little bit until we see his NFL debut. This is the second foot injury Garrett has suffered this offseason, following on a lateral sprain to his other, left ankle during minicamp. That was was potentially more worrying because it involved the same foot that bothered Garrett throughout his final college season. This is presumably—hopefully—just a freak thing. And obviously the Browns are in no hurry to rush him back. Cleveland’s not going anywhere for a few years, so there’s no reason to hurry Garrett’s recovery or his debut, no matter how excited I am to see him play. Heck, put him in bubble wrap and hold him out all season if you need to. (I’m not clear on whether the Browns are actively tanking this year or just regular bad, or if there’s a functional difference between the two.) But please remember the inviolable rule of Cleveland Browns drafts: It’s not that they make bad choices, it’s that bad things happen to good players after the Browns pick them.